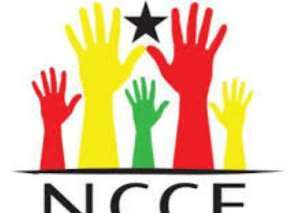 The Techiman Municipal Director of the National Commission for Civic Education (NCCE), Mr. Jobila M. Zakari has urged citizens of the Country to actively participate in the planning and execution of Government projects in their respective communities. Mr. Zakari said this during a social audit community Durbar held at Nkwaeso in the Techiman Municipality of the Bono East Region. The NCCE Director said the Durbar aims to promote community ownership of policies and development projects and explore the level of transparency and accountability in the local governance process, in accordance with Act 936, Section 40 of the Local Government Act, 2016. The NCCE Director was of the view that community ownership of government projects provides two-way information sharing tools for all stakeholders involved, which goes a long way to deter kickbacks, bribes, and stealing of resources intended for the projects, per Article 35(8) of the 1992 Constitution. On his part, the Assemblyman of Nkwaeso/Hansua Electoral Area, Mr. Leo N. Mac Eshun said that there is still a long way to go in terms of information sharing regarding participatory execution of Government projects, adding that “there is the need to correct these kinds of discrepancies”. Contributing to the discussion, one of the participants, Mr. Peter Agyen suggested that, community members would do a better monitoring view of Government projects if contractors are openly introduced to the community before the start of the project. Another participant, Mr. Osei Jacob, recounted that it is always bad to find contractors on site working before the community gets to learn about the project. The program was funded by the European Union (EU) with support from the Techiman Municipal Assembly (TMA) and Department of Social Welfare and Community Development.